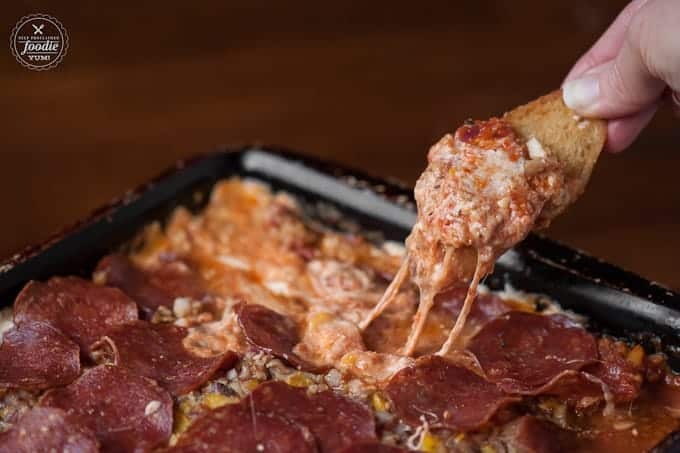 This sinful but incredibly delicious Loaded Cheesy Pizza Dip is simple to make and is the perfect game day appetizer to feed a hungry crowd! 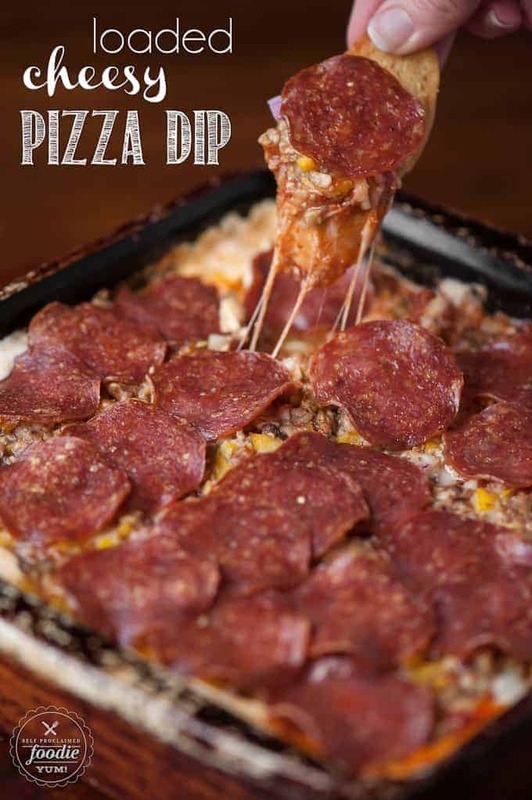 Have you seen that BuzzFeed Food video that has been floating around social media on how to make pizza dip? 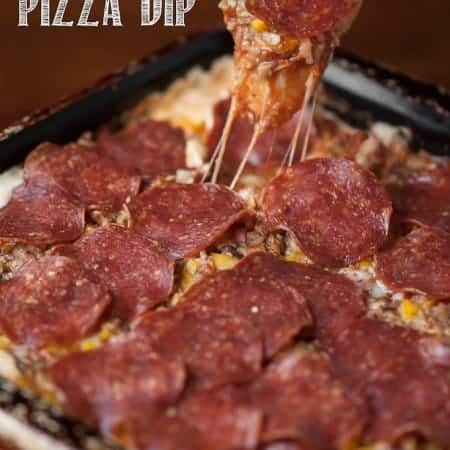 I’m a huge sucker for those 30 second recipe videos and I’ve had pizza dip on the brain ever since I saw it. Of course, my goal was to make it even better than their version, and I’m happy to say I succeeded! Step 1: break in my brand spanking new Cuisinart Food Processor. What an awesome and necessary part of my kitchen this appliance has become. 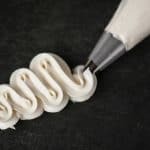 I use it for everything from shredding to chopping to kneading dough. I love lots of toppings on my pizza. Like lots and lots. The problem is that I usually put so many toppings on my pizza that the dough never properly cooks through because there’s too much moisture. That’s another reason why this pizza dip was so great – I didn’t have to worry about soggy crust! 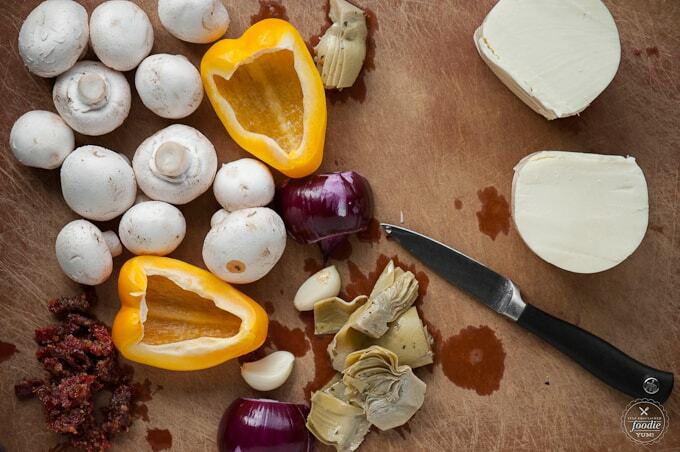 My goal was to chop each ingredient up really small so that it just became part of the dip. Who likes to dig into a hot gooey cheesy dip and have huge chunks of toppings fall off your toasty piece of bread anyway? I also prefer to get chunks of cheese and shred them myself. 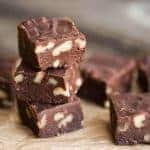 The preshredded stuff is fine if you’re in a hurry, but it typically costs more per pound and never tastes as good compared to when you grate it yourself. 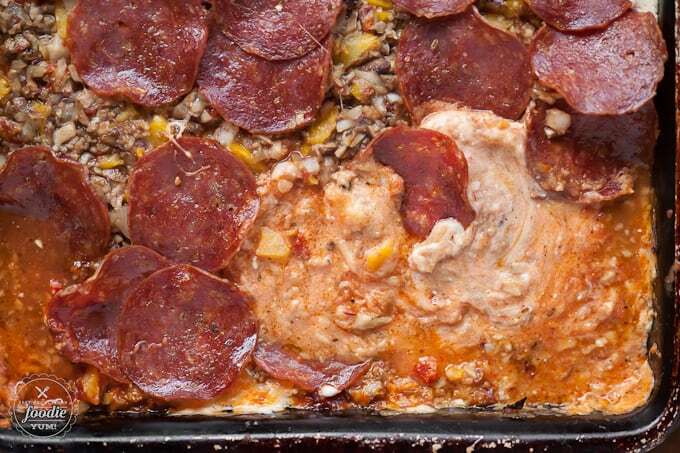 Here’s how I constructed this wonderful pizza dip. First, you heat up some milk, cream cheese, mozzarella, and parmesan in a saucepan to create the base layer. 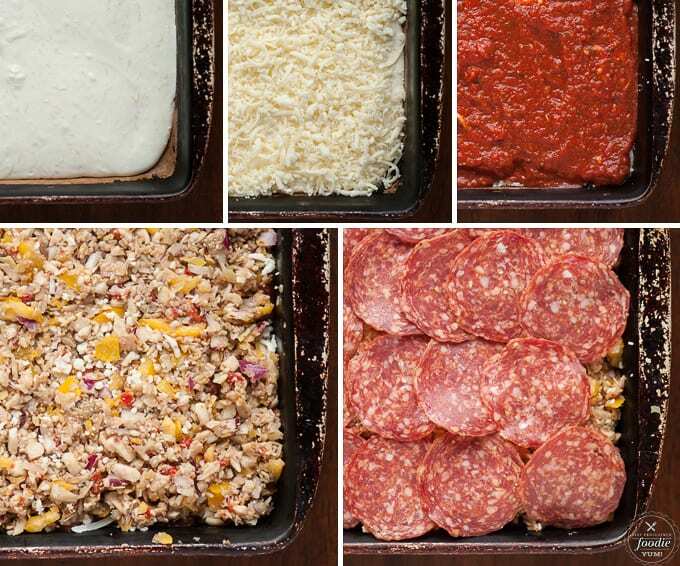 Then, you layer the mozzarella, spaghetti sauce, more mozzarella, the toppings, and then pepperoni. 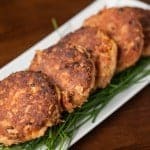 I always prefer to put my pepperoni on top because I love crispy pepperoni and the veggies taste even better when the fat from the meat melts down into them. You know I’m right. Pop that baking dish into a very hot oven and watch the whole thing become perfectly melty and gooey good. I was really afraid that I put too much sauce in, but it all worked out so perfectly. I wouldn’t have changed a thing! Plus, the veggies were chopped up so small that they gave the dip the perfect flavor without making it chunky. YUM! 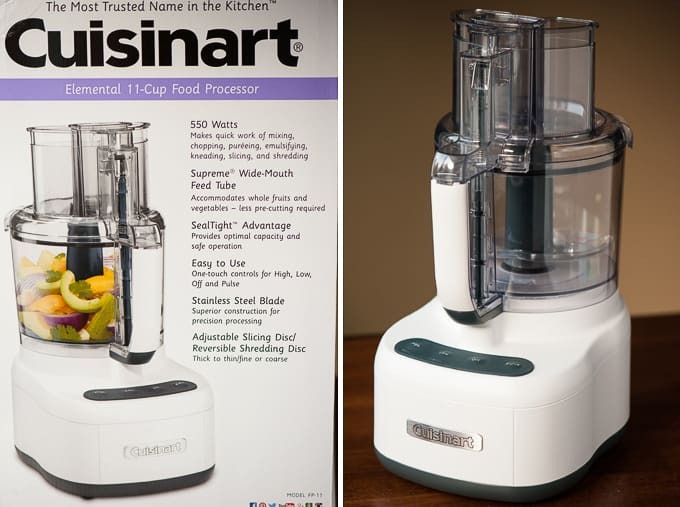 Use Cuisinart food processor to shred cheese and dice toppings. In a medium saucepan over medium heat, combine milk, cream cheese, 1/2 cup of the mozzarella, and the parmesan cheese. Stir frequently until all the cheese has melted. Transfer to a 9x9 inch baking dish. Cover with half of the remaining mozzarella cheese. Add spaghetti sauce and spread to create an even layer. 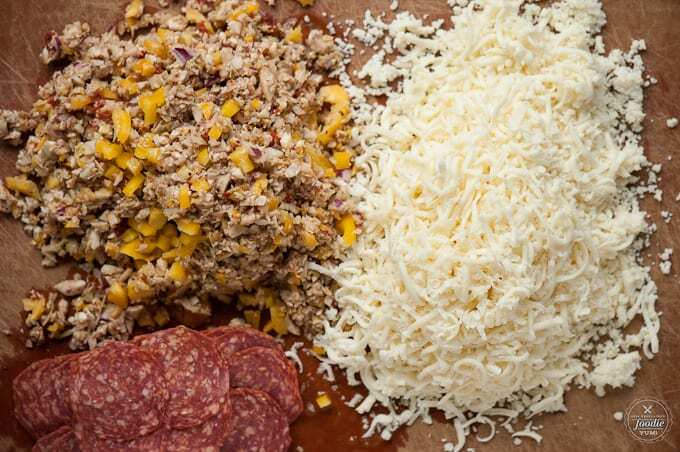 Next, add all of the diced toppings. Then, cover with a single layer of pepperoni. Cook in preheated oven until hot and bubbly, 15-20 minutes. Enjoy with a thinly sliced baguette that has been toasted in the oven with olive oil. 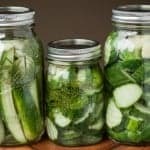 Can be prepared ahead of time and reheated in the crockpot. This is especially awesome for tailgating!